Green schools for everyone within this generation. Westview K-8 Duval County School -- LEED Gold ... hurricane shelter ... autistic wing ... and came in under school district's long-term energy goal! When you look at many of our schools today, you see outdated buildings in need of repairs, burdened with unsafe toxins, dwindling budgets and outdated resources. The picture is not pretty. The USGBC Center for Green Schools 2016 State of Our Schools Report and below infographic proves this sorry state. Twenty-five percent of Americans go to school each day as a student, employee or volunteer. Additionally, Americans spend 90% of their time indoors. There is zero question that teaching students the importance of healthy buildings is of critical importance. Every day homes and schools impact a child's respiratory health and ability to concentrate and perform. Studies show that green schools, in particular LEED certified schools, result in fewer asthma attacks, reduced sick days, increased teacher satisfaction, increased school spirit, and even increased test scores. Engagement of educators and informing leadership from school Boards to college presidents about the benefits of healthy, high-performing schools. Working with state and local governments to draft smart, practical policies. Providing trainings and helpful resources to those who need it most -- K-12 schools serving lower-income families, under-resourced institutions, and community colleges. Disseminating advocacy tools to support USGBC student groups and our nationwide network of more than 1,000 Green School Committee volunteers. We want to inspire innovation that can be replicated and deployed to every school and every college and university campus in this country and beyond. Hosting and growing Green Apple Day of Service nationally and internationally every single day. "We Learn Here and Where We Learn Matters" (:30 Spot) from Center for Green Schools on Vimeo. 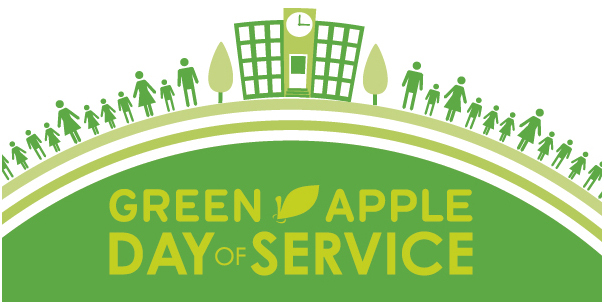 The Green Apple Day of Service (GADS) is a worldwide phenomenon, a truly global initiative. Since its inception in 2012, Green Apple Day of Service has inspired more than 10,000 school improvement projects, commitments and events in 72 countries and all 50 States, engaging more than 700,000 volunteers. Collectively, GADS efforts have impacted more than 7 million students worldwide. GADS gives parents, teachers, students, companies and local organizations the opportunity to transform schools into healthy, safe and productive learning environments through local service projects. Check out project ideas, pick up helpful event resources, find an event in your area, and register your 2016 project today! In 2015, volunteers from the seven Regions of the USGBC Florida Chapter contributed significant support and energy to this worthwhile cause. But we can do better! Mark Saturday, September 24, 2016, on your calendar as a day set aside to will join hundreds of Floridians making a hands-on difference by greening schools in your community. In addition to the links above, reach out to info@usgbcflorida.org with questions.